In my earlier article, we have seen how to capture and return the error messages from stored procedures. Now we will see how to implement transaction along with exception handling. In any transaction scenario, we have to rollback transaction on error in SQL execution. 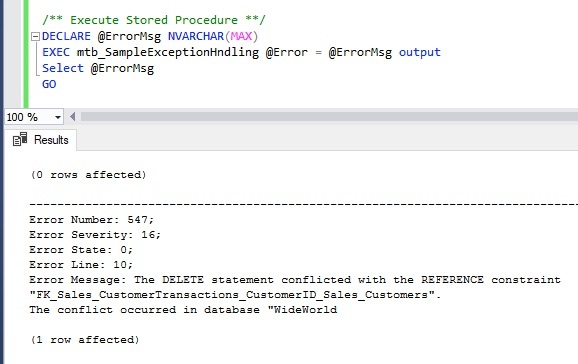 Using TRY-CATCH we can capture the exception occurred in a statement in the stored procedure and in the CATCH block we can rollback the transaction. Below is an example. In this example, In the CATCH block after capturing the error details, we can place the ROLLBACK TRANSACTION. About TRY-CATCH, and implementing transaction in stored procedure at Microsoft Docs.